Phuket Golf View Villa - 3 Bedroom, 4 Bathroom Pool Villa available for Rent! This stunning pool villa is located in the peaceful and natural surroundings of Kathu Phuket. The villa provides complete privacy and its peaceful location makes it perfect for those seeking the utmost relaxation. 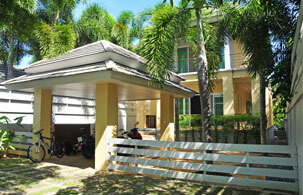 Phuket Golf View Villa is ideal for families who are looking for accommodation which offers a high standard of life. Set on a 400 square metres plot of this two storey home offers an amazing 252 square metres of living space with the added luxury of its own private pool. All rooms including living room, bedrooms, and kitchen are fully furnished and offer all modern amenities such as air-conditioning systems, CCTV, etc.